At the start of 2017 my objective was to finish the remaining 13 states in my 50 States Endurance Challenge. I had most of my races picked out but I was having trouble finding a half marathon in Connecticut that fit into my jam-packed schedule. Looking at the race calendar on the 50 States Half Marathon Club website, I found a race in Hartford, Connecticut in January – the Arena Attack. January in Connecticut can be full of ice and snow. That wasn’t a problem for this race. 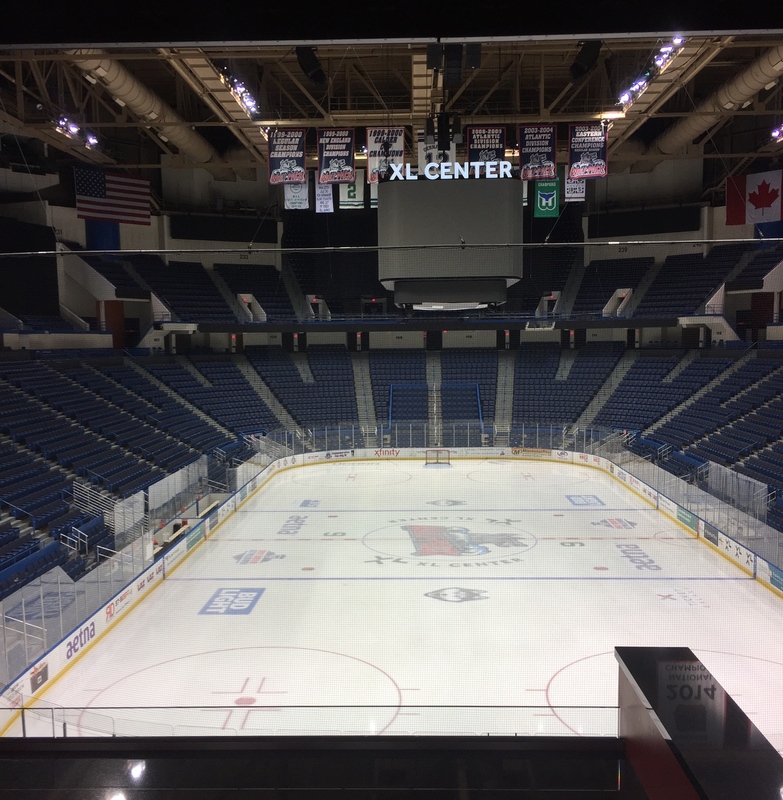 It was going to be run indoors around the concourse of Hartford’s XL Center. Although this race has been rated among the most difficult half marathons in the world by halfmarathons.net, I was not intimidated. I am always looking for ways to vary my half marathon and marathon experiences. I have run through amusement parks; around auto and horse racing tracks; through professional football and baseball stadiums; over a covered bridge; across a desert; up a mountain in Colorado’s Rocky Mountains; and through a mile-long underwater tunnel that also crossed an international border. This was going to be another new experience. The Arena Attack races were the idea of Scott Sutter of the Southern New England Athletic Association (SNEAA). Scott ran track and cross country in college in South Carolina. If the weather was too hot or rainy, the coach would make the team run interval workouts on the concourse of the field house. Fast forward to 2012 when Scott remembered those indoor workouts. He knew in the middle of winter the race calendar in New England is pretty empty. 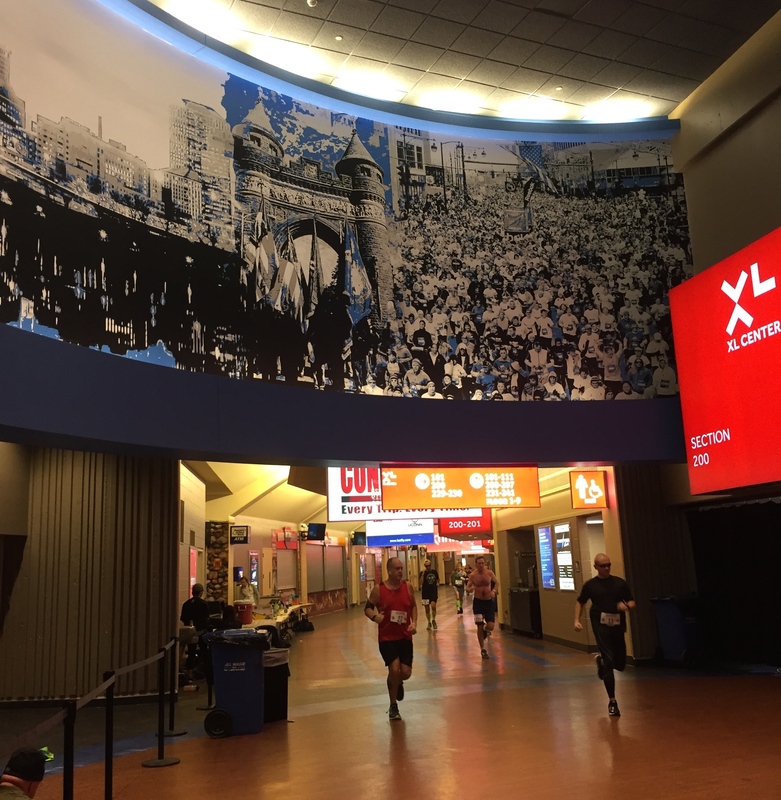 Running on the concourse of an arena would be perfect for dedicated runners looking to get in a long run. Let’s face it – runners are pretty nutty. They will run anywhere they can. SNEAA offers a 5K, marathon, and two half marathon heats as part of the Arena Attack. Not surprising – all of the races in Hartford sold out. When I mentioned to my running group that I was planning to run this race, they brought up several concerns. Would the course be crowded with runners? What would the temperature be inside the arena? Would the floor get slippery at the water stop? Would it be boring running in circles? None of these things worried me because Scott addressed them all in the pre-race guide. I was focused on the positives. I would be running on a flat course in Connecticut (can’t find many of those even along the coast). There would be multiple bathrooms along the 330-meter course and I would never be more than a few steps away from any of them (and no lines!). I would have to run 65 laps around the arena but it would be better than slogging out 13.1 miles on a treadmill in January and I could check off another state in my 50 States Endurance Challenge. From my perspective, this was a win-win. Since the course is narrower in a few spots, the number of runners is restricted. There were two heats for the half marathon with between 35 and 40 runners in each. (The marathon was run concurrent with the two half marathon heats and was restricted to 25 runners). I ran in the second heat of the half marathon. Not only was this my first indoor race, this was the smallest race I have ever run. When we got going, everyone quickly spread out and settled into their own pace. I never felt crowded like I do in a race with significantly more runners where we run on wide streets. I also liked that the tile floor was laid out in stripes that were like lanes all the way around the concourse. They were easy to follow. The arena is home to the Wolf Pack hockey team and a number of kids’ hockey teams. They keep the temperature inside the arena in the 50s so the ice rink doesn’t melt. I think the ice also helps to keep the indoor air temperature down. Scott had recommended runners wear shorts and singlets. I followed his suggestion and was comfortable. Although it seemed strange, I also wore a visor just to keep any sweat from rolling down into my eyes as I ran. The water stop was one table set up with water, Gatorade, and bananas. Marathon runners had separate tables where they could leave their own sports drinks and nutrition items. During the pre-race briefing, Scott emphasized the need to prevent spills on the course. Wet floors would be hazardous to the runners. Kudos to all the runners – I never saw any spills. I passed this sign 65 times. As we ran, there was music playing to keep the runners entertained. Races like the Rock ’n Roll series have bands or DJs set up every mile or so along the course. In actuality, runners only hear them when they get within about 25 yards of the band or DJ. It ends up being occasional little spurts of music. The rest of the time we are left alone to listen to people huffing and puffing as they run. This race was different. Since we were running around the arena, I could always hear the music. It was a change for me because I don’t run wearing earphones and listening to music. I use my training runs to think about things I need to do, work out problems, or just take in the scenery. I wouldn’t say that I disliked hearing music the entire time. It was just another different aspect to this race for me. In addition to the Arena Attack races in Hartford, SNEAA also holds another set of Arena Attack races in Mullins Center on the campus of the University of Massachusetts Amherst. The Mullins Center is a little smaller so half marathoners have to do 67 laps instead of 65. The Amherst edition of Arena Attack sold out too. Overall, I have to say the Arena Attack Half Marathon was an interesting race. The number of runners was small and everyone was sensible about the “don’t spill water” request. I never had to stress out about finding a bathroom along the way. Even better I didn’t have to carry my own water bottles. The water stop was never very far away. The availability of bathrooms and the water stop made this a very pleasant race for me. The only suggestion I have to improve the race would be to liven things up a bit. It might be fun to allow runners to suggest songs for the music playlist. Maybe even have a little commentary every once in a while too (“this song goes out to Justin who is finishing up lap 38!”). I would recommend anyone looking for a new twist on racing to consider running one of the Arena Attack races. Running indoors is definitely a unique experience.